Wooden Freighter: Built in 1918 by the Hodge Shipbuilding Co., Moss Point, MS; Acquired by the Navy 18 November 1918 and commissioned at the Navy Yard Dock, New Orleans, LA; Decommissioned 19 December 1919 and returned to the United States Shipping Board; Scrapped in 1924. Specifications: Displacement 2,511 t.; Length 268'; Beam 45' 2"; Draft 23' 6"; Speed 10 kts. ; Complement 57; Armament none; Propulsion one 1,400iph engine, one shaft. 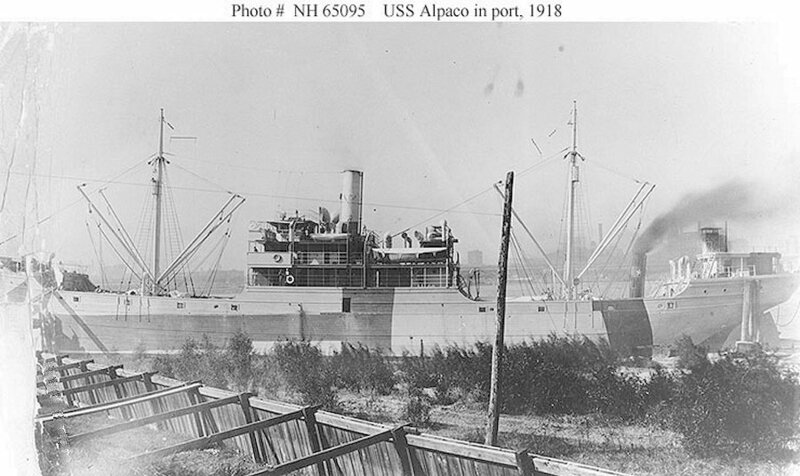 114k Photographed in port, circa late 1918.